As we approach end of Christmastide, a look at Charles Wesley’s “Hark! the Herald Angels Sing” appeared fitting. Even today, of course, C. Wesley’s beautiful nativity hymn has a sustained popularity. However, like most old methodist songs, it’s undergone some adaptations over time, perhaps minor ones. And, like many other Wesleyan songs, ‘Hark the Herald’ has been received throughout the Protestant denominations, even with Restoration Christians like the Church of Latter Day Saints (LDS). A quick overview makes something of the case. 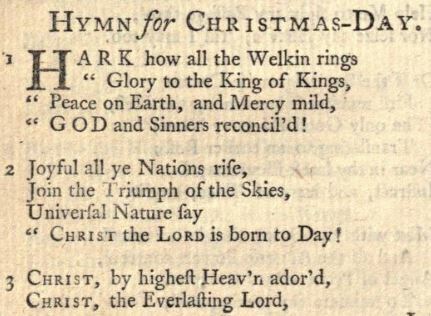 The pleasure of singing Wesley’s “Hark the Herald…” is perhaps the relative orthodoxy of its prose, e.g, “God and sinners reconciled!”; “Offspring of the Virgin’s womb”; “Born to give them second birth”; “Hail the incarnate Deity”. Such lyrics are refreshing at a time when psycho-therapy and self-affirmation increasingly replaces the power of the Gospel. However, as the song has gone through modification over the years, some of these scriptural truths have been removed or edited. Most of us are familiar with the words of the Hymn, and if anyone is uncertain the text of the Song can be read here. The first verse, “Hark how all the Welkins Ring/ Glory to the King of kings”, likely stands out in stark contrast to our accustomed song. ‘Welkins” is an old-English word for ‘skies’ or ‘heavens’. Obviously, this did not survive the cut. In 1759 George Whitefield evidently was the first to alter the first verse to the now endearing prose, “Hark the herald Angels Sing/ Glory to the newborn King”. Indeed, it became more poetic to the ear, yet “King of Kings” seems to have a slightly greater theological punch– though I believe no foul intended. 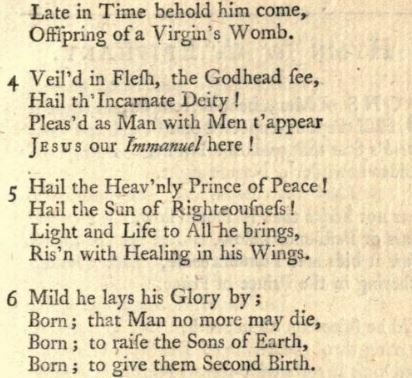 Whitefield also changed the last line in the second verse, from “Universal Nature say/ Christ the Lord is born to Day”, to perhaps the more familiar “Nature rise and worship him/ Who was born in Bethlehem.” Notice the phonetic ‘e’ in ‘Bethlehem’. While both verses pay some tribute to the rise of 18th-century Natural Theology, references to the chorus of Nature would eventually disappear in favor of the phrase, “With the angelic host proclaim”. I believe this nixing of Nature is somewhat unfortunate since the purpose of Natural Theology was to subsume scientific discovery and the Gentile faiths of ‘noble heathens’ (perhaps like the Magi) to Revealed Religion. It also better ties the lyrics back into “Peace on Earth” as well as the Apostle’s Roman 8.22 ‘the whole of Creation groans’. A very nice line probably forever gone. It’s surprising how Whitefield’s limited adaptation of Charles Wesley’s song became the standard. By the late 18th-century we find the Whitefield-Wesley rephrase in the New Version of Psalms, aka. Tate and Brady Pslater. The New Version was the Hymnal for the Church of England. It also was the first Psalter which began incorporating mostly Evangelical hymnary, starting with Watts and Wesley thru appendix.1 Upon the Protestant Episcopal Church’s eventual formation, this kind of expanded New Version became the standard hymn book for North American Episcopalians until the rise of the Oxford Movement or so-called Catholic Revival. More interestingly, what both Whitefield and PECUSA’s appropriation of this Nativity Hymn reveals is the unity English Protestants once enjoyed among one another as they improved or restated each others Inspired music. It also shews something of Methodism’s societal nature, cutting across denominational lines despite Anglican biases, as being no respecter of Party. Methodists have always claimed their catechism or system doctrine was their hymnology. In so far as this may be true, the likely influence of liberal theology, or secularization, ultimately watered-down Wesley’s more orthodox parts. Consequently, by the third decade of the 20th-century we see Reformational verses expunged, such as, “Adam’s likeness, lord, efface”, “in Us the Serpent’s Head”, et al.. Also, the hymn is typically found at a maximum of three stanzas. Gone is longer version. 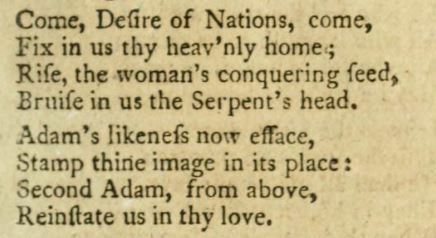 Even the 1939 Methodist Episcopal Hymnal followed this pattern, almost taking a Unitarian cue, replacing “Offspring of a Virgin’s Womb” for “Finding here his humble Home”. So, the picture of the manger’s poverty, or moral example, supplants the essentially Wesleyan notion of Mary’s Virginity, dare say “Mother of God”. 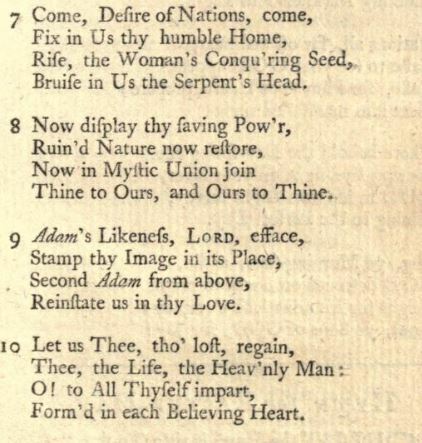 More strident Unitarian renditions, such as those belonging to the Church of God or LDS, simply skip the second stanza which contains the controversial “Hail the Incarnate Deity”. The Mormon Song book’s adaptation is Hymn 209. We sang the old version, “Hark how all the Welkin Rings”, this Christmastide, concluding our New Year’s Covenant Service. We even sang Wesley’s poetic petition “Ruined Nature now restore”. Without being overly Pyrrhic, ‘Hark the herald’ has undergone a diminution of Evangelical truth while it’s gained favor in a backsliding Anglo-American civilization. However, it remains a material witness to our past, stratified by various amendments, as well as pointing to many serious Christian fundamentals. It’s wide acclaim by Protestants of all sects, especially at this particular Christmas season, testifies the impact Wesleyanism, and therefore the Church of England, has had upon the other English denominations, even LDS which has roots in the New England Revival of the 1830’s and continues to place the venerable name “Charles Wesley”, citing his authorship, to the bottom of the hardcopy of the hymn sheet. Who knows how many Beehive saints will, as a consequence, become students of Wesley’s life (and therefore mission)? Hence, it’s the case with every denomination. So, there’s something of a victory here midst our present dissolution, or older capital we ride upon if we so choose to access it. 1. Watts and Wesley essentially sum Protestant hymnology. They alone go far in restoring what was once a common Protestant culture, partly bound by song (which is a catechism of sorts), in the United States if not formerly British North America.